Looking for the best insulation for your pole barn? Seal up your new or existing structure with spray foam insulation. You finally built your dream pole barn, but you’ve noticed lately the temperature inside never stays consistent. In the winter, whenever you’re working on your car or tinkering with your tractor or creating a woodworking masterpiece, you feel cold drafts coming in. In the summer, whenever you check on the outdoor toys you have in storage, you feel really hot air seeping in. Put an end to this pole barn nightmare. It’s time to turn to foam insulation. Unlike traditional fiberglass insulation, no matter what size or shape your structure is, foam insulation is a perfect fit, every time. When you add foam insulation, your pole barn will suddenly have a full air barrier, keeping temperatures consistent year round. To make this dream come true, call us today at 888-936-3626 for a free estimate on your pole barn insulation. Pole barns come in all shapes and sizes which causes the cost to insulate with foam to vary project-to-project. Learn more about factors that determine the cost. What steps are involved in the install process? Spraying foam in your pole barn will fill every nook and cranny making it a more comfortable space. 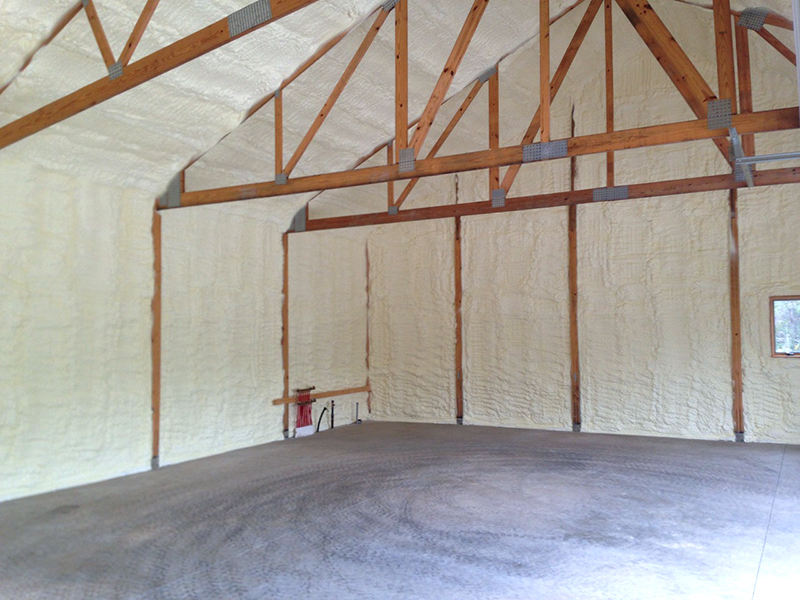 Learn more about our pole barn insulation process. What financing options are available for my insulation project? Many insulation projects have several different options for financing. Learn more about what financing options are available for you. I’m still stunned at the effects of having my pole barn foam insulated. I first jumped on board with Indiana Spray Foam back in 2013 when I had my pole barn foamed. I have yet to see frozen water in there. At -20 below it was 34 degrees in there.